Mangaluru, Apr 03, 2019: A cargo vessel on way to Colombo from Singapore, has collided with a fisheries boat which had ventured into fishing from New Mangalore Port break-waters on March 29. 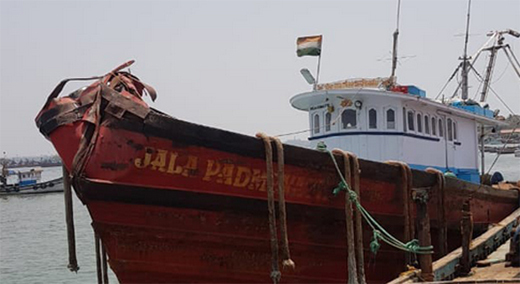 All nine fishermen on board the fishing boat ’Jala Padmavathi-2’ escaped unhurt. However, the boat belonging to Bengre resident Srinivas Salian has suffered extensive damage. MV Chenaya Naree is the name of the cargo vessel which was involved in the collision. Officials say such collisions can be averted if cargo vessels have Automated Identification System (AIS) installed in them. Boats too should have navigation lights on either side, he says.